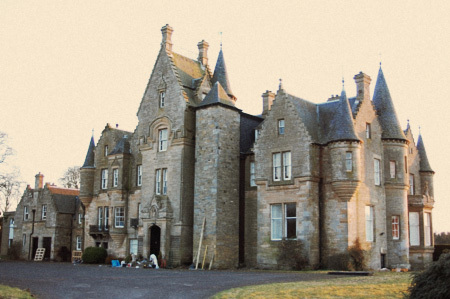 Kinloch house is a Scottish B listed mansion. Built in typical scots baronial style, the property received extensive internal restyling in the 1920’s under the supervision of the prolific Scottish architect, Sir Robert Lorimer. This magnificent building however, parts of which date back to 1699 retains many of its original interesting features including a highly complex roof. The first task for our client was a pre-purchase survey. Nine months later after purchase, Jones and Fraser returned to carry out vital repairs to the roof, which included extensive lead work, reparation of the slated conical tourelles and stair turrets, and chimney repointing. Original cast iron gutters also received our attention. Subsequently Jones and Fraser have been asked to reinstate string courses and other various aspects of ornate masonary. Internally Jones and Fraser have completed lime plaster and ornate cornice repairs. Work continues with confirmed plans for a new extention in 2012.